Buy Severin Taranko a Coffee. ko-fi.com/ideenzoo - Ko-fi ❤️ Where creators get paid by fans, with a 'Buy Me a Coffee' button. 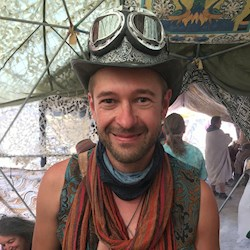 I am creative mind and passionate Burner, living in Dresden, Germany. When I thought about what I could contribute to Burning Man Culture I came up with the idea to create beautiful wristbands. I want to turn something ordinary into a wearable, philosophical art piece. This has become my passion and put a lot of time into creating them. Please support my art if you can. I am in the process of creating the official wristband for AfrikaBurn in 2019. It will be funded by the by the international Burner Community. All together we have to raise about 3.500 €. Can you help? Secured Payments. Support goes to Severin Taranko's account. Upgrade Severin Taranko to a yearly Gold Membership with a one-time payment.